Plan Ahead. Give yourself extra time to get things right. You're presenting the slideshow or video to a group of people, so don't wait until the last moment to render your slideshow or edit your video. Give yourself at least a day or two buffer after rendering so if you need to change something, you can. Learn About Your Projector. Most projectors work best at a specific resolution. If you can figure out the resolution, it will make rendering your slideshow or video easier. Try to match the resolution of the movie to the projector. If you don't know the resolution, you can usually safely use 720p video for good results on most projectors. Keep it Lively. It's a dark room and everyone has probably just eaten or is waiting to eat. Don't put them to sleep. Keep the soundtrack lively, and the pictures moving along. Check out our article on slideshow length for more information. Use High Quality Photos. Brighter, vibrant photos will play better than dark and drab. The room will already be dark to accommodate the projector. Use a Dedicated Video Player. If you're using a computer to play the video, quit all other applications other than the player for best performance. Also remember that Photo to Movie is an editor, not a player. You should render your movie and use playback software such as QuickTime Player instead of the Photo to Movie preview. Play a DVD. You also have the option of burning to DVD and using the DVD for the projector. This presents an easy to connect solution since most projectors can easily be connected to a DVD player. The downside is the low resolution of DVDs (480p). Computer Cable Connections. Does the projector support HDMI or VGA or DisplayPort? Does your computer support the same standard? Do you have the cable? Is it long enough? These are questions you should answer before your presentation. Video Distribution. 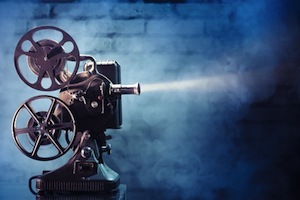 Will your audience want a copy of your slideshow video? Will you charge for it? Give it away for free? Download it from the internet? Figuring these things out before hand can save you a lot of work after the presentation. If you're using a projector to show a slideshow or a video, these tips will help you be prepared and pull off a spectacular presentation. If you have comments or questions, please email us.